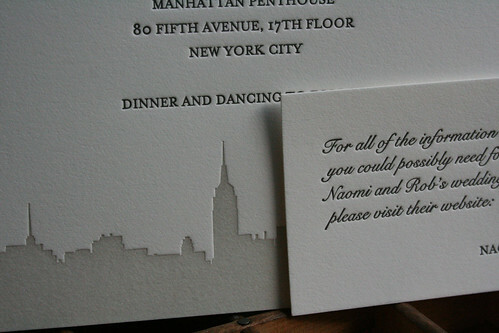 This week I printed invitations for a really nice couple getting married in manhattan this spring. 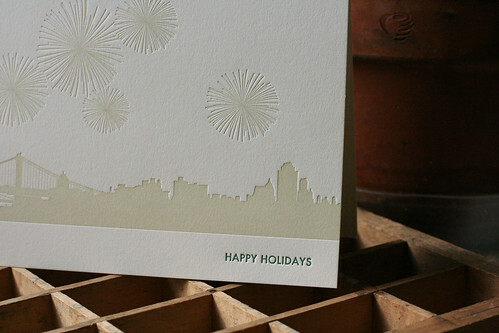 I love the grey color of the skyline, and they chose a gorgeous beet color envelope liner. 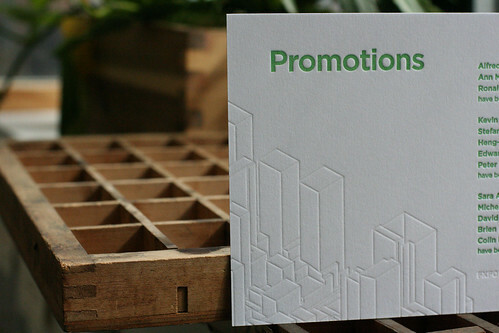 They also included a business card sized insert for website info, which I think is a smart solution to the great ‘where does the website go’ debate. 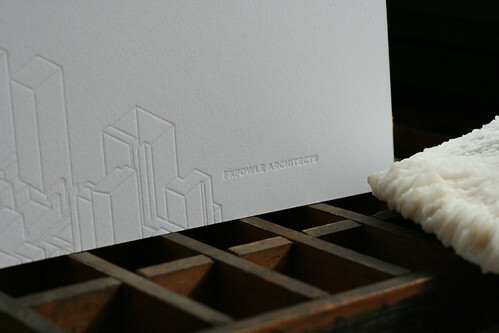 In my first year of printing I used the very large guillotine cutter at the Center For Book Arts in Manhattan. It worked very well, but was incredibly intimidating (there was actually a rule that you couldn’t use it if you were alone in the room). However when I moved into my own studio in Brooklyn it was no longer practical to cut large amounts of paper there and then try to get it back to Brooklyn without spending too much on a car service. I then tried a short-lived experiment of using a little non-electric guillotine with a clamp to hold down stacks. It wasn’t long before an attempt to trim a wedding invitation job turned into disaster (I had to reprint the whole job after it cut a stack inaccurately…). 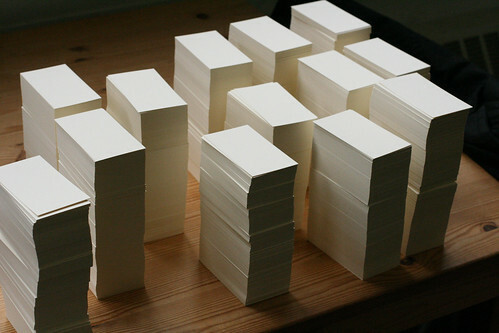 After that I started having paper pre-cut by my paper distributor. That was better but still tough, as it’s rare that a job doesn’t require a final trim after you’ve finished printing. Seriously, I’m almost done the the website! It’s not such a dramatic style change, but it has been a steep learning curve going from GoLive to Dreamweaver. 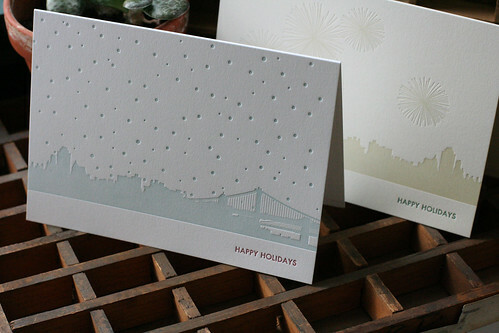 In the meantime I’ve been working on new some photography, and finishing up this year’s holiday cards. I’ll post a link when it’s finally up, and then after that pick up with thoughts on guillotine cutting. This was a very large run on heavy 179lb stock, so I was thanking my stars for having a great guillotine cutter this week. 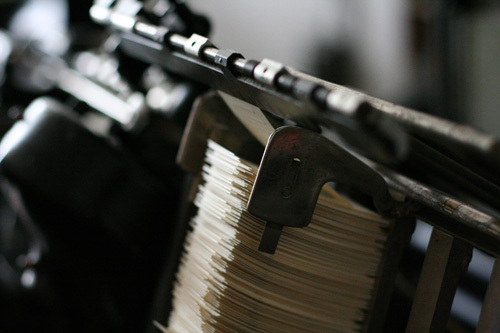 I had a few emails recently about the merits of investing in a good cutter, so I think my next post will be about cutting stacks. Maybe we can get a few comments going on different methods.